This means that for example on 5D Mk III, ISO 800 with ML has more dynamic range than iso 100 with Canon :-> … and at high ISO you’re getting 7% more dr which is nothing to sneeze at, esp. 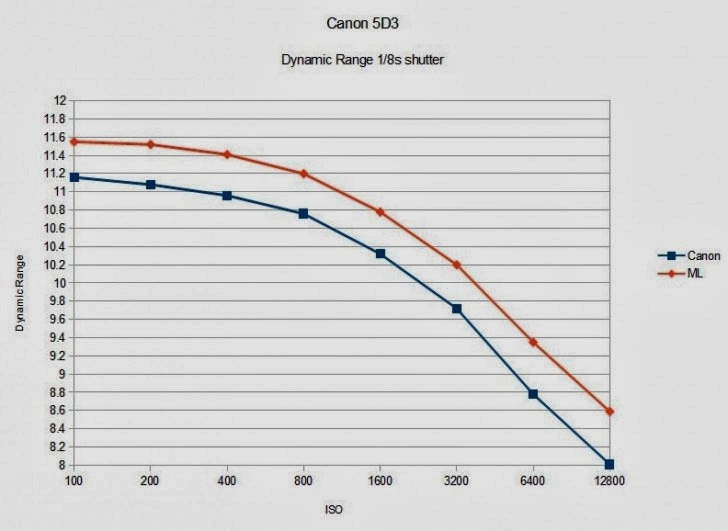 since it builds upon Canon‘s advantage vs. Nikon: D800@6400 = ~8.3 & 5D Mk III@6400 = ~9.4 ev. According to sensorgen.info the 6D should add another 2/3 stop (once the code is adapted for it) making good ol’ Canon the superior sensor for low light high contrast shooting. Since this is a piece of software unsupported by Canon and may void your warranty, anyone using the Magic Lantern software bears all the risks and responsibility. For those who want to push the envelope, this new development may prove to be a boon for both stills and video shooters.